High intensity Xenon bulb generates up to 12,000 peak beam candlepower. 5 hour continuous runtime on 3 C alkaline batteries (not included). Spring loaded clip, sealed switch, shock resistant polymer case, unbreakable polycarbonate lens. A combination of 7 three-way adjustable brilliant white LED bulbs in this flashlight give you hands-free flexibility and long run time. Provides short range (1 LED _ 120 hour run time), medium range (3 LED's - 72 hour run time) and longer range (7 LED's - 22 hour run time) lighting. 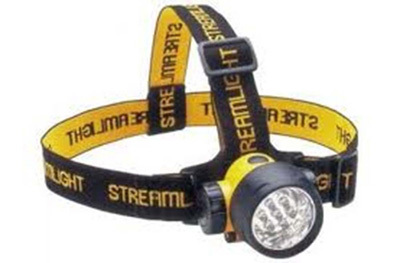 Adjustable fabric head strap, 90 deg. tilt movement, water-resistant thermoplastic yellow body, rubber-shielded bezel and unbreakable polycarbonate lens. 3 AAA alkaline batteries included. 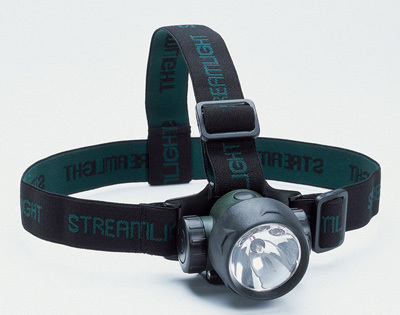 This lightweight hands-free headlamp includes an adjustable fabric head strap, 90 deg. tilting head, spot-to-flood focus, and 3 levels of lighting for short, medium and long distances. Rubber-shielded bezel and unbreakable polycarbonate lens. 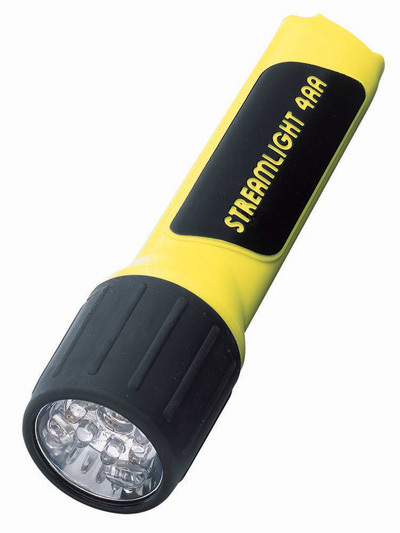 This compact, durable, water-resistant flashlight gives you hands-free operation in three different configurations _ 1) as a clip-on light to a hat, straps or equipment, 2) clipped to the adjustable head strap, or 3) carried on its convenient neck lanyard. 360-degree rotation projects a white lightfrom 3 super-bright LED's that is visible for over a mile away! 120 hours continuous runtime on 3 AAA alkaline batteries (included). 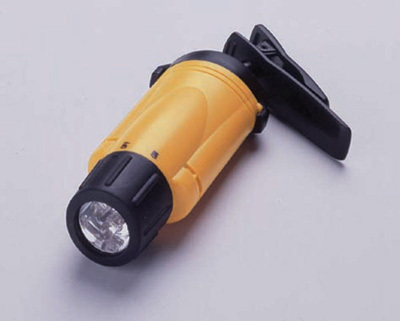 An indispensable tool for all outdoor and industrial applications. 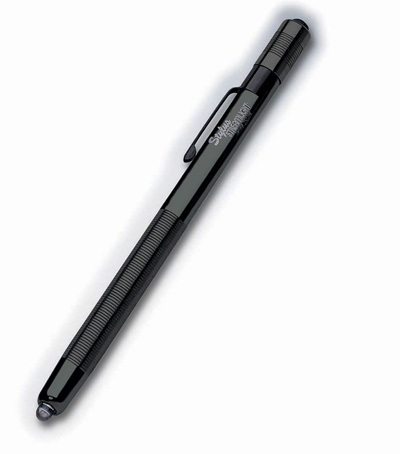 This ultra-slim, powerful penlight is cased in tempered aircraft aluminum with black anodized finish. The high-intensity 12,000 millicandellas white LED has a 100,000-hour lifetime. 10 hours continuous runtime with 3 AAAA alkaline batteries(included). Blink or constant on switch. Removable tip guard for focusing the beam is included. High intensity Xenon bulb generates up to 6,000 peak beam candlepower. 4 hour continuous runtime on 4 AA alkaline batteries (included). Shock resistant polymer case, sealed switch, unbreakable polycarbonate lens. Waterproof, non-conductive, corrosion-proof. UL Class I, Division I. 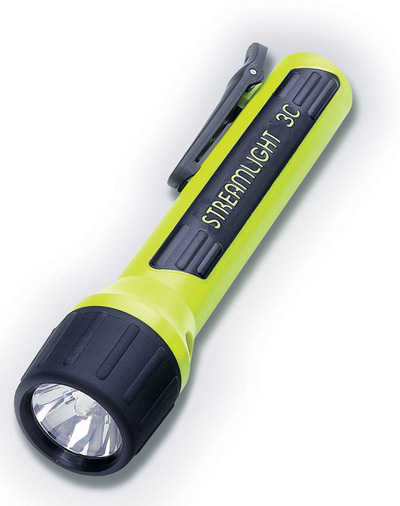 Seven high-intensity, unbreakable LED's generate up to 27 lumens. 155 hour continuous runtime on 4 AA alkaline batteries (included). Shock resistant polymer case, sealed switch, unbreakable polycarbonate lens. 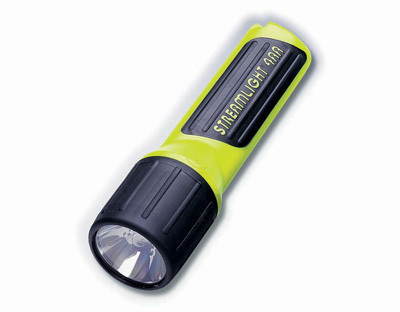 Rechargeable 3.6 volt, 1.8 amp nickel-cadmium battery can be recharged up to 1,000 times. Runtime is 1 hour continuous use between charges. 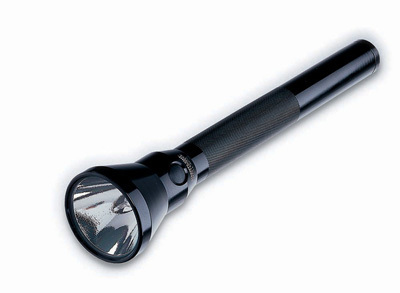 Xenon bulb produces 15,000 candlepower. Includes two 10-hour snap-in recharger holders with AC and DC charge cords. Black anodized aluminum housing, unbreakable polycarbonate lens. 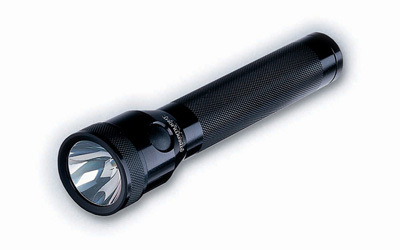 When you need a powerful light, this Xenon bulb flashlight produces 75,000 candlepower! The NiCad 6 volt, 1.8 amp battery is rechargeable up to 1,000 times. 1 hour of continuous runtime between charges. Black anodized aluminum housing is corrosion proof inside and out.